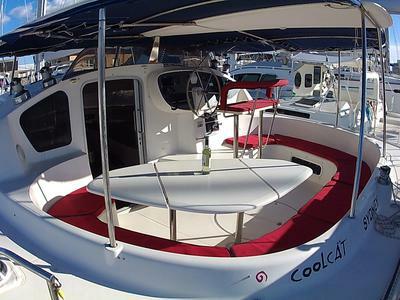 FP Bahia 46 catamaran in top condition with a great inventory. This privately owned Bahia has been meticulously prepared for long term live aboard world cruising. The rig is more generous than on most cruising cats, giving good performance. The Bimini is clean in appearance yet strong. The dinghy davit arrangement is excellent. The sculpted hull and deck lines add a touch of elegance. Confortable spacious and in exceptional condition. Ready to sail. 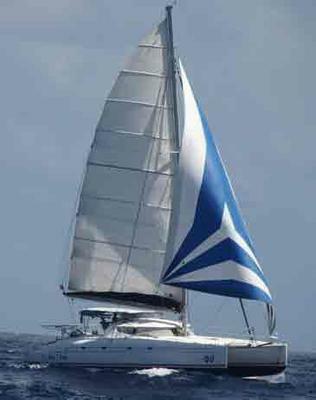 With a complete inventory for live aboard cruising.This catamaran is known for its ability to sail. Confortable spacious and in exceptional condition. With a complete inventory for live aboard cruising. As a result of a recently installed) faulty fitting, the entire rig was lost overboard in 2017. The hulls suffered no damage. 2 x 40 HP Yanmar 3 cylinder diesels with ST 50 saildrives and 3 bladed Kiwiprops all in great working order. The Bahia from Fountaine Pajot a classic, known for its fast and comfortable sailing ability. - 2 in the middle of theach hull. - 4 Jabsco heads,one in each bathroom, 1 with Y valve to holding tank. 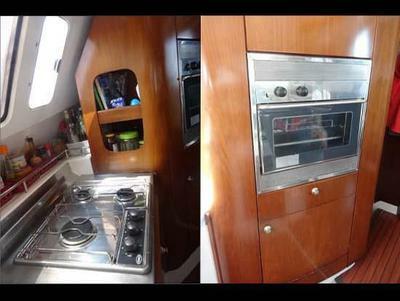 - Pressurised hot and cold fresh water to galley, 4 bathrooms (showers and hand basins) and deck shower. - 4 x 150 watt solar panels on the davits. - 2 x 80 amp alternators. - Victron 12v to 220 v inverter 2800 watt. - Water-maker 60 l/h. (desalinator can be run entirely by solar panels from 10 am to 4 pm on a sunny day. - Fridge + freezer 2 water cooled very efficient compressors. (The solar panels are more than adequate to keep food frozen and the fridge cold in even in the hottest conditions ie. - Iridium Satellite phone with deck antennae. - Stereo with saloon and cockpit speakers. - Semi rigid dingy with 18hp Toshiba. Fast enough to wake board! 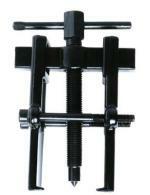 - 40 kg spade anchor with 75 meters of 12mm (heavy) galvanized chain. Second 35 kg Delta anchor + 8 kg aluminum anchor. - 100 m. x 35 mm. hawser rope. - Mooring lines and fenders. - Large cockpit with full set of cockpit cushions. 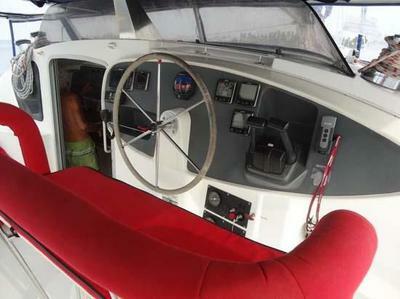 - The raised helm station has a cushioned seat large enough for 2/3 people. - Biminy with removable zip on clear plastic panels all round. - Also with removable zip on sun shade (mosquito) screens all round. - 1 Diesel tank 400 liters. - 10 x 10 liter jerrycans for extra Diesel. - 2 fresh water tanks total capacity 860 liters. - Mosquito/fly screens on all hatches and also the main entrances to the saloon and the two aft cabins. - Bedding matresses recent and all bedding included. - 2 full sets of diving equipment. Bottles, regulators, gauges, stabilisation jackets, dive computers spear guns masks flippers etc. - Countless spare parts for winches rigging, Jabsco heads, sail repairs, fridges etc.etc.etc. - Karsher high pressure water cleaner. - Paper Charts for most of the world, Pacific Atlantic Med Caribbean US etc. - Electronic charts for everyere in the world. - Asymmetric spinnaker with sleeve. 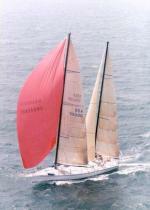 Both the Gennaker and Spinnaker can be rigged from the bowsprit or the bow pullies. giving repeat instruments in cabin or saloon. - Echo sounder, Boat speed and heading, COG + SOG etc. from 3 multi display screens in cockpit. - AIS Vesper watch mate transceiver with GPS intergrated. - VHF radio west marine 5600 with distress calling button. - EPIRB McMurdo Fastfind 406 Mz.